When AMD announced their new Radeon Software Crimson Driver we expected a new UI, a few minor features and not much else, but AMD have really surprised us with what they have achieved here. While a lot of these new features could be defined as something that AMD has needed for a long time, like AMD FreeSync Low Framerate Compensation and DirectX 9 Frame Pacing, it is great to see that these features are now here and function correctly. One of the main advantages that AMD's FreeSync has had when compared to Nvidia's G-Sync is how FreeSync handles Low framerates, which is a problem which is now fixed with AMD's LFC technology. Sadly not all FreeSync displays will support LFC, but those that do will deliver a G-Sync like experience at low framerates, which is fantastic to see. When looking at our performance date we can see that AMD has done a great job squeezing a little more performance out of their Fury X GPU, delivering a little more performance in almost all the games that we have tested at 4K, with the performance of Star Wars Battlefront getting a significant boost in performance. If AMD's promise of more stable releases and continuing to improve their drivers in this way AMD will do a lot to reclaim a good reputation for their drivers online, truly leaving the ATI's legacy behind them. All in all we are very impressed with AMD's Radeon Software Crimson Driver, so much so that I have no problem recommending that you update to this new driver as soon as you are able. With the Performance boosts that AMD have been able to deliver with their recent Fallout 4 Driver and Radeon Software Crimson things certainly look good for AMD on the driver side. 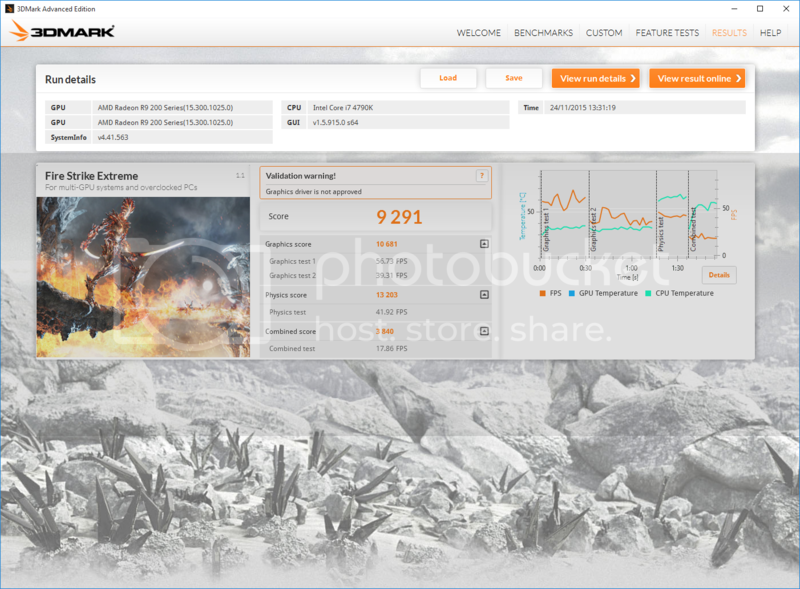 AMD's Radeon Software Drivers are Available to download on AMD's official website. You can join the discussion on AMD's Radeon Software Crimson Driver on the OC3D Forums. 'Radeon Software Crimson'? It's just awkward to say, the lack of grammar and eloquence has immediately cheapened their efforts, as always. Surely anyone in the English speaking world would change that to Radeon Crimson Software before presenting their new idea to anyone remotely resembling management. Will AMD ever manage to finish one thing as well as they started it before they die. It even looks quite good, and tasteful, with some very practical features but.... uhhh AMD, I can't watch. To someone never bother to read, of course it sounds awkward or cheap. Clicking the 3dmark links below each image will show you what specs/clocks im running, if anyone would like me to try some games, ask and if i have them ill try them.